Lanner Falcons are often used in the sport of falconry. Adult Lanner Falcons may sometimes cooperatively hunt with their offspring. This may be their way of teaching their young different hunting strategies. Because Lanner Falcons occasionally feed on people's domestic fowl, they may be at greater risk of human persecution. 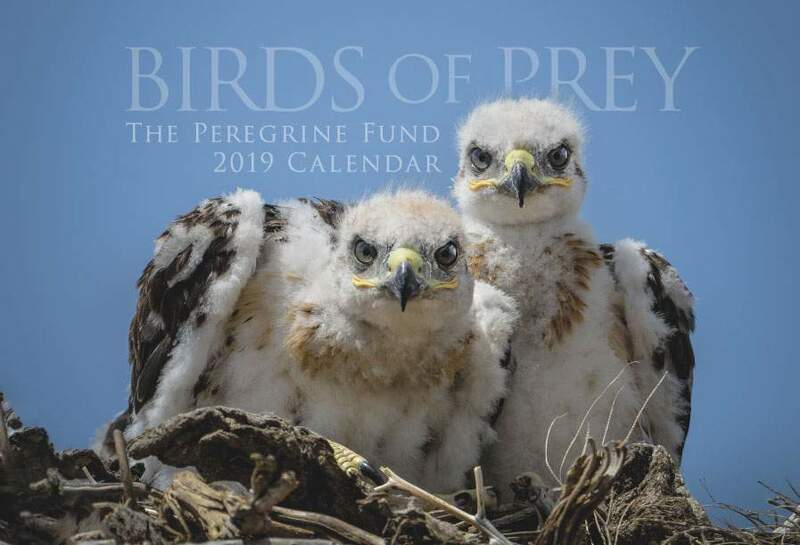 Though The Peregrine Fund doesn't work directly with Lanner Falcons, our efforts in scientific research, habitat conservation, education, and community development help conserve raptors on a global scale. We also supply literature to researchers from our avian research library, which helps scientists around the world gather and share important information on raptor conservation. The Lanner Falcon is found throughout much of the Mediterranean, the Middle East, and parts of Africa. This large falcon can be seen soaring the skies in search of food or perched on a ledge from Italy and Greece, to Georgia, Armenia, and northern Iran, all the way to Ethiopa and Sudan, East Africa, Angola, and the southermost part of South Africa, . The Lanner Falcon lives in a wide variety of habitats from sea level to 7,500 feet. It can live in deserts, forests, woods, plains, and savannas, but needs rocky crags and cliffs nearby for nesting. It can even be seen in areas where people live. In Ethiopa, for example, it has been observed in the middle of cities perching quite happily on top of lamp posts! The Lanner Falcon physically resembles the Peregrine Falcon in many ways. However, the Lanner Falcon sports a reddish cap on the top of its head, which helps distinguish it from many other similarly-colored falcons. Indivdual Lanner Falcons vary quite a bit in size and coloration depending on the region in which they live. But generally speaking, it has a light-colored breast that is decorated with darker blotches or stripes. It has a slaty-colored back with a long tail and dark-tipped wings. Its cere, legs, and the skin around its eyes are all bright yellow. The Lanner Falcon is a powerful, swift and well-equipped hunter. 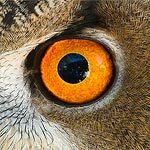 In addition to long, powerful talons, it has a special notch on its beak called a tomial tooth, just like most other falcons do. This sharp, triangular-shaped ridge on the outer edges of the upper mandible is used to help kill prey quickly. When a Lanner Falcon captures an animal in its talons, it might not be able to kill its prey right away with just the strength of its feet, so it bites the prey's neck, severing the vertebrae and killing it instantly. The Lanner Falcon can sometimes be seen on exposed perches, using its sharp eyesight to watch for passing prey or scanning the horizon for potential predators or other threats. It also spends a lot of time soaring, sometimes to great heights. This swift raptor is usually found alone or in pairs, or during breeding season in small family groups. However, sometimes these birds congregate in small groups, especially at grass fires or other areas where prey may be present in larger numbers. Like many birds of prey, Lanner Falcons are facing many threats, including loss or alteration of their habitat, electrocution on power lines, poisoning and human persecution. In general, the Lanner Falcon is doing well but the European population is experiencing a decline and is at risk. Like most other falcons, the Lanner Falcon feeds mostly on birds – small and large – including larks, ducks, sandgrouse, poultry, doves, and even other small raptors. One biologist observed a Lanner Falcon attacking a bustard, a bird about two to three times heavier than the falcon!! But the Lanner Falcon doesn't eat only birds. It eats a whole host of other animals including small mammals, such as bats and rodents such as the common gundi, the fat sand rat (yes, that is really its name), and the Eastern rock elephant shrew. This falcon also feeds on snakes, lizards, and insects such as termites, locusts and grasshoppers. Such a diet requires a variety of hunting techniques. The Lanner Falcon may capture prey after fast pursuits or it may fly up above its quarry and make a hard stoop onto it. This species is also known to hunt by flying low over the ground or along slopes and cliffs as it searches for prey. This falcon can often be seen hunting in pairs, often with one bird flushing the prey and the other making the grab. Scientists have even documented these falcons following people as they walk in certain habitats to catch any prey the humans may scare up. The Lanner Falcon, like the Orange-breasted and Taita Falcons, doesn't build its own nest. 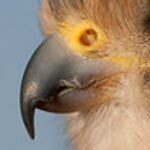 Instead, it lays its eggs in small scrapes on rock ledges of high cliffs or in abandoned nests of other species, including storks, crows, and other raptors, both in trees and on power poles. In open desert, they may nest directly on the ground among rocks. During courtship, the male and female engage in some impressive flight displays. When the time comes, the female lays 2-4 eggs, sometimes five. Both the male and the female work together to care for and protect their eggs and young. First, they must spend around 32 days ncubating the eggs, and then another 42 days protecting and feeding their chicks. When the young fledge, or fly for the first time, parent care doesn't stop. The young remain with their parents for up to another three months, while they learn to hunt, avoid predators, and otherwise take care of themselves. When Lanner Falcons are two to three years old, they are old enough to find a mate and begin raising young of their own. The World Center for Birds of Prey has a lovely Lanner Falcon that is occasionally used during bird demonstrations. We also offer many fun ways to learn about birds of prey. The visitor center offers interactive displays, tours, interesting videos and a children's room with activities from coloring sheets to quizzes to costumes and a touch table for the curious mind. We also have several different birds of prey on display year-round. Knowledgeable staff and volunteers are on hand to answer any questions you may have about Lanner Falcons or any other bird of prey.